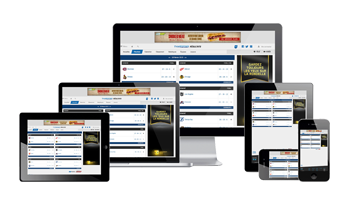 Soho Media’s Multiplex™ live sports stats solution brings together responsive design, seamless integration and more than 120 leagues to choose from, keeping it laps ahead of hosted solutions. Because Multiplex™ solutions are custom built, our widgets and stat pages match the existing look and feel of your site or app and allow publishers to highlight their hometown teams. But don’t confuse custom with expensive. Our business model can bring the cost of a Multiplex™ solution to less than that of hosted solutions. In fact, in many cases, publishers can generate additional revenue from advertising on Multiplex™ pages. Another Multiplex™ advantage is the ability to aggregate data from several sources — professional leagues from familiar providers; and minor, junior and local leagues directly from the leagues themselves, or from Soho Media’s Prep Score Center™ CMS. Integration onto your desktop site or native tablet app is no more complicated than a simple copy and paste of code. We manage the ongoing maintenance of data feeds and the relationships with the data providers. Pick and choose which leagues are most important, and we’ll take care of the rest.